Please note that the content of this book primarily consists of articles available from Wikipedia or other free sources online. The NCAA Division II Men''s Basketball Championship has been conducted since 1957. 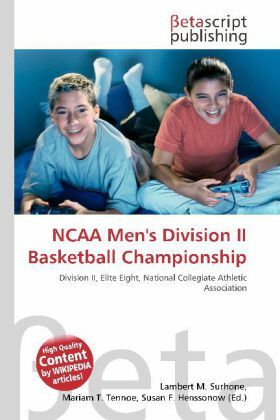 Like all other NCAA basketball divisions for men and women, the champion is decided in a single-elimination tournament, and like in Division I, the Division II tournament has 64 teams. However, the Division II tournaments for men and women differ in one major respect from those in Divisions I and III. The finals of both Division II tournaments consist of eight teams, instead of the four in the other two divisions. The eight survivors of regional play meet in the Elite Eight (an NCAA registered trademark) at a predetermined site.